Bulimia VS Anorexia – Which Poses The Gravest Danger? As the author was researching dangerous psyciatric issues online, he came across a pro-anawebsite. The images and trending topics on how to lose weight the extreme way are shocking to say the least. Since this is is a psyciatric issue that many parents or relatives do not know about, the author highlights its corresponding dangers. Every now and then, we come across two different health disorders that are so similar to each other but have very different names. Their similarity sometimes makes it hard to distinguish one from the other. Anorexia – Anorexia nervosa is an eating disorder characterized by immoderate food restriction and irrational fear of gaining weight, as well as a distorted body self-perception. It typically involves excessive weight loss. Anorexia nervosa usually develops during adolescence and early adulthood. 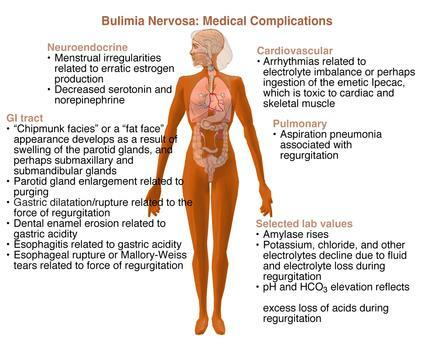 Bulimia – Bulimia nervosa is an eating disorder characterized by binge eating (a pattern of disordered eating which consists of episodes of uncontrollable eating.) and purging, or consuming a large amount of food in a short amount of time followed by an attempt to rid oneself of the food consumed (purging), typically by vomiting, taking a laxative or diuretic, and/or excessive exercise. These acts are also commonly accompanied with fasting over an extended period of time. What makes differentiating between them a challenge? The main reason why it’s hard to distinguish between anorexia and a bulimic is due to the many similarities that these two conditions exhibit. For instance, brittle hair and nails, dry skin, sensitivity to temperature changes, and constipation are but a few of the symptoms these conditions share. Other common denominators are the psychiatric after effects which can include guilt, fear, low self-esteem, and shame among others. The most obvious outwardly sign with bulimics is that they usually have normal body weight whereas anorexics can be typically identified by their thin and frail continence. Which of the two conditions poses the greatest threat to a person’s life? Although both conditions have their own varying degrees of life-threatening factors, anorexia stands out as the more deadly. The reported lifetime prevalence of anorexia nervosa among women has ranged from 0.9% – 2.2% and 0.2 – 0.3% in men (Keski-R et al 2008).6 With regard to bulimia nervosa, estimates of lifetime prevalence among women range from 1.5% to 2% and 0.5% in men. According to an analysis of medical literature by Jon Arcelus, MD, PhD, of the University of Leicester, England, and colleagues, their study found anorexia to carry twice death risk of schizophrenia and three times to death risk of bipolar disorder. Although anorexia is by far the deadliest eating disorder, death rates are also higher than normal in people with bulimia and “eating disorder not otherwise specified” (EDNOS, a common diagnosis for people with a mixture of atypical anorexia and atypical bulimia). Although Bulimia and EDNOS carry significant risks, the researchers noted that people with anorexia often become bulimic and are then at a high risk of relapsing into anorexia, which further increases their death risk. It was noted that suicide is a particular risk since one out of every five anorexics die by this means. Apart from suicidal tendencies, which revolve around the psychological state of the afflicted, there are also very serious physiological or biological dangers associated with anorexia. Hypokalaemia for instance, is the usual cause of death in anorexia people. Hypokalaemia’s most obvious cause would be insufficient consumption of potassium (low-potassium diet) or starvation. Another recent anorexia-related death was said to be primarily because of very low sugar levels. At the age of 19, Bethany Wallace was firmly set on being a successful model. However, despite being very attractive, she never felt she was beautiful enough. The doctors believed that her heart couldn’t take the strain she was imposing on her body as she became both anorexic and bulimic. Low blood sugar would surely not be the only cause of death but rather one of several factors leading to the unfortunate event. Why couldn’t this be averted? Remember that teenagers, especially these days, feel that they know everything there is to know about them and what’s right for them. This was the problem Beth’s parents faced all the time. They couldn’t talk sense into her when even the mere mention of food would cause an argument. If perhaps she was a lot younger, things may have worked out for the better. To lay some credence to that, let’s go back to the study mentioned earlier. It also found that a person’s age plays a major role in anorexia death risks. Three fold when diagnosed before age 15. Tenfold when diagnosed at ages 15 to 19.18 fold when diagnosed at ages 20 to 29. Sixfold when diagnosed of ages 30 and older. Despite all these scientific facts and data supporting the dangers of anorexia (and bulimia for that matter), there are still many individuals who believe that it isn’t a disease. Many such individuals have put up pro-ana websites and blogs that claim that it isn’t a disease but a lifestyle. One such blog exemplifies this view of being pro-ana. In the letter, you might want to take note of all the various errors made in writing as well as the state of mind the writer was in during the time of writing. Another interesting fact about anorexia or bulimia is that it doesn’t escape even the affluent and the famous. Does anyone know what happened to Karen Carpenter, one of the great singers of the 70s? However, considering all the lives she has touched with her big contributions to the music industry, perhaps its would be fitting to remember her as someone who was very good on skins as well.